The creation and development of Chief Brand Products cannot be looked at in isolation. It must be looked at together with its creator, father and mentor, Mr. Sayeed Khan. The life stories of both are so similar that they could be treated conterminously. The following is a history and account of his life and the birth of Chief Brand Products. Sayeed’s grandfather, Ahamad Khan, came from India as a labourer to work on the sugar plantations. Subjected to the rigours of the indentureship system, Ahamad Khan had to contend with physical punishment, and restrictions on basic individual freedoms – mobility, ownership, etc. Mahamoud Khan, Sayeed’s father grew up in the period following the termination of the indentureship system. At age 22, he was already married and the father of four children – Moen Khan, Sayeed Khan, Kassuman Khan and Hazra Khan. At the age of eight, Sayeed had to face the trauma of his parents’ separation. Many of his friends believed that this undoubtedly contributed to his spirit of independence and his yearning to be a self made man. At Warrenville Presbyterian School, Sayeed received a rudimentary education, limited by time and financial constraints. As a young boy he was already demonstrating leadership qualities by captaining windball cricket teams and generally “leading the boys”. At the age of fourteen, Sayeed had to sacrifice his academic pursuits when his father decided to move to Charlieville and open a small shop. Amidst all these turmoils of his early life, the dream of being “educated” remained strong in Sayeed’s mind. At the age of fifteen he registered at the International Correspondence School to pursue studies for the Junior Cambridge exams, determined to hold true to this dream. However, circumstance prevailed once more, as the financial problems of his family cut short this venture. For two years Sayeed would have to sacrifice his ambitions by helping his father in their mini-grocery store. His father would often entrust the running of the business to Sayeed, on occasions when he could not be present. This undoubtedly gave him practical business experience and, years later, Sayeed felt that this early experience with his father gave him the responsibility and capacity to venture into entrepreneurship. In 1947, at the age of 17, business at his father’s establishment took a downfall and Sayeed had to seek employment to aid in supporting his family. He began working as a fireman at the Chaguaramas base, where he found himself greatly impressed by the cool and calculated professionalism of the Americans. During his job tenure at the base, he was able to learn a great deal from them. This knowledge would prove to be very useful to him in the years to come. After eighteen (18) months Sayeed switched jobs and went to work at the base in Wallerfield in the commissary as a clerk. However, he found this new job to be impersonal and constraining, leaving him no room to develop and express his creativity and imagination. Sayeed realized that the regimented lifestyle and job were not for him, and left the base in 1950. In 1950, Sayeed returned to Charlieville and re-commenced work in his father’s grocery. For Sayeed, working with his father once more offered him room to exercise his initiative and innovation, which could not be released while he was working for the Americans. At the age of 21, Sayeed was married under Islamic rite. By age 25 he was already a father of 4, and was still helping his father run the grocery store. At 39, with 9 children, Sayeed found himself faced with a situation where he needed to channel his energies into other areas in order support his family. Although the cost of living in those days was not particularly high, it was still immensely difficult to maintain a family on a day to day survival basis. At the age of 30, Sayeed decided to use his entrepreneurial skill and initiative by making a move to start his own business. Sayeed began a business by purchasing a rice mill in order to mill rice. He chose rice because Charlieville was primarily an agricultural area and one of the major crops was rice. While not being overly profitable, Sayeed looked at the rice business as another avenue to raise finances for supporting his family. Using his ingenuity, Sayeed milled rice at minimal and sometimes at no cost, but realized some profit by selling the “husk” as animal feed. By the age of 34 Sayeed had acquired experience in procuring, delivering and marketing goods as he drove trucks, planted cane and sold agricultural produce in the market. As he so nicely put it; “I was not really cut out for working for others”. His spirit of independence and autonomy negatively affected his performance when working for others, even for his own father. To Sayeed, he had not yet found his true destiny. By the time Sayeed was 35, he knew he had found his true destiny: “the curry business”. As a young boy, he was always an avid fan of traditional Indian delicatessen. Throughout his teen years and early married life he was always experimenting with combinations of spices to bring out new and special tastes in his cooking. Additionally, Sayeed was the recipient of inherited family spice secrets, as certain knowledge about blending and mixing spices was passed down from his grandfather to his father, and then to him. One writer summarized as follows; “Mr. Sayeed Khan, in July 1957, commenced business on a small scale and in accordance with time honoured, far eastern traditions; skillfully and exclusively grinding and blending a variety of aromatic spices and condiments, specially formulated to combine with the natural flavours and juices of meats, seafoods, poultry and vegetables, by following the secret formulae of his ancestors”. However, business was not all clear skies and smooth sailing when it was underway. “Chief” (as Sayeed is known by his intimate friends) decided that at 35, he had reached such a high standard in his own private recipes that he could capture a viable market if he undertook the production and sale of his specially flavoured curry. He also realized that in particular, people of East Indian descent would avail themselves as a ready market as they were accustomed to grinding their own masala and other flavouring ingredients by hand. Apart from this being a time consuming and inefficient exercise, the resulting yields of curry and masala lacked the unique taste which Sayeed’s secrets and knowledge could provide. Sayeed started his business at Caroni Savannah Road. The first machine to grind the curry was a corn milling machine. Sayeed used his ingenuity to modify the mill by changing the blades and replacing them with ones of a finer mesh to produce curry powder. However, he quickly abandoned his invention as the heat generated burnt out the nutritional value and the flavouring capacity of the curry powder produced. Firm in the belief that his curry business would be a success; Sayeed took a loan and purchased a pulverizing machine for $20,000. He visited the United States himself to personally choose the machine that he felt would be best suited for his business’ needs. By September, 1957 Sayeed had started to produce curry in triangular packages. At the end of the year a van was purchased and in the typical one-man business situation, he toured Trinidad peddling his products himself. 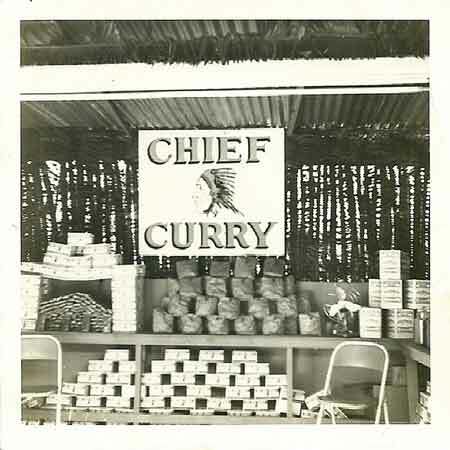 During the early stages of Chief Brand Products, the production and sale of curry alone could not sustain and maintain his family. Therefore, while trading his curry, Sayeed took the opportunity to buy and sell other products. To a large extent, in 1957 Sayeed was really engaging himself in haberdashery. Along with the curry, agricultural produce such as eddoes, rice and potatoes were sold. Nevertheless, the emphasis and focus was always on the curry. On Saturdays, Sayeed’s loneliness on his business trips was relieved by the presence of one of his sons who was quite contented to accompany him to “tour Trinidad”. To Sayeed, this period was perhaps the most important of his business life. At this stage, he was able to communicate directly with his customers, trying to sense their likes and dislikes and blending his flavours accordingly. While making his trips and conducting his market research, he discovered that there was a demand for “sophisticated curry”, i.e. curry in cellophane packets. As a result, Sayeed initiated negotiations with the Industrial Development Corporation to obtain funding to purchase cellophane packaging machinery. Sayeed was able to obtain duty free concessions on raw materials and machinery. As Sayeed admitted, “if it were not for the concessions I obtained from the Government it is doubtful whether I would have been in business today”. The name of his brand became known as “Chief “. There was an interesting reason for Sayeed’s choice of this particular brand name. According to him, “the American influence was very strong”. At the time, people were hesitant to purchase locally produced goods. With his brand name “Chief “, along with the introduction of a logo of an American Indian Chief being imprinted on his packs, Sayeed’s brand gained popularity . 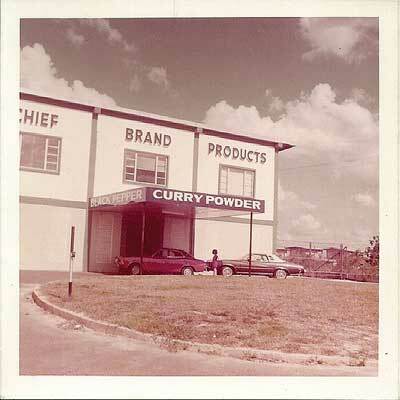 The first curry factory at Caroni Savannah Road proved to be the embryo of the present Chief Brand Products Manufacturing and Processing Complex. As far as business goes there are always setbacks – both major and minor. For Sayeed Khan, the major trauma occurred when his daughter’s hand was severed off by one of his machines. This left a long and lasting imprint on Sayeed’s mind which remained with him until the last days of his life. With business slowly picking up Sayeed purchased a pulverizing machine capable of processing 800 pounds for the day. However, the demand was not that high and he only worked the machine 3 days per week. 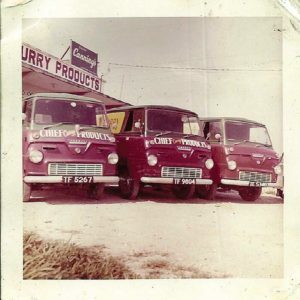 By 1968, business began to pick up at a faster rate and Sayeed, with his experience in curry, decided to produce curries of different taste and flavour. During some of his past experiments he had realized that curry was no limited to one flavour only, and that it was possible to make many different flavours of curry. It was his idea that these varying flavours could suit a diverse range of tastes, and Sayeed thought that it was good business sense to market this idea. Following the realization Sayeed introduced Taj Madras Curry and in later years would introduce Kala Brand Curry. During this time, Chief’s coffee in small packets was making quite a hit on the market. From Sayeed’s perspective, different types of curry were quite successful. The success of his sales was due more to the high reputation and quality of Sayeed’s products, rather than media advertising campaigns. At this time, Sayeed purchased another van and had a staff of ten (10) (which is in sharp contrast to the Chief Brand Products workforce of today). With this increasing profitability in curry and to a lesser extent coffee, Sayeed began specialization of the production and sale of these products. He diverted his energies away from the sale of haberdashery, rice milling and other menial pursuits and placed major focus on these two products. In 1969, Sayeed took a loan and purchased half of an acre of land for $50,000.00 at Akbar Road, Charlieville, for the projected expansion of his company. The purchase of this land suggested the confidence that Sayeed had in his business, employees and, most importantly, himself. In the same year Sayeed moved to the quieter surroundings of Valsayn. This never affected his punctuality, and level of commitment and dedication to his business. Every morning before 7:15 a.m. and until 6:50 p.m. for six days a week Sayeed was a permanent fixture in the office, packaging room, delivery building and elsewhere. Construction of the new factory site was initiated in February 1970. This move was necessary because of space problems at the old site were also due to an increased demand being placed on his limited manufacturing facilities. It was Sayeed’s to construct a building of suitable size for an office, manufacturing, processing and packaging plant. On December 19th, 1973 the building was completed. History in the production of spices was made in January, 1974 when Sayeed moved over to Akbar Road to his “new factory”. In the following years the business would continue to expand, encompassing more than 50 products in more several different categories: Curry/Indian Products, Baking Products, Spices & Seasonings, Natural Products, Drink Mixes and Chiefeez Snacks. 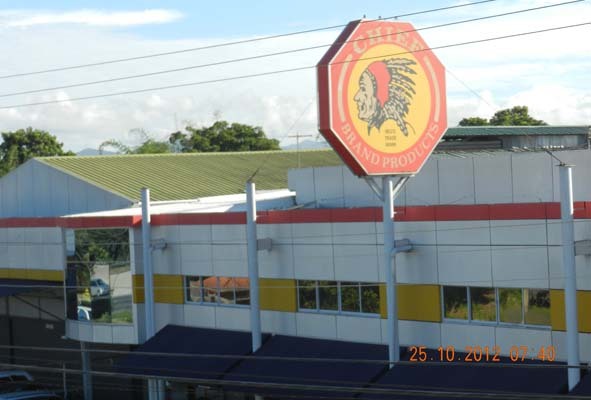 Chief Brand Products is now a household brand name in Trinidad and Tobago, and is well known in various other countries to which the products are exported. The company has come a long way from Sayeed’s humble beginnings back in 1957.